The Graduate School of Modern Society and Culture is a comprehensive graduate school of the humanities and social sciences. Classes with small numbers of students and a multiple-guidance system help to produce highly specialized professionals with the ability to investigate various issues. The School also welcomes many mature and international students. This program systematically imparts advanced knowledge and interdisciplinary methods of analysis, related to information, culture, arts, philosophy, psychology, and domestic and health sciences, thereby cultivating an ability to discover and pursue issues related to contemporary culture, and developing specialists and researchers with specialized knowledge in information culture, artistic culture, philosophy, psychology, and domestic and health sciences. This major systematically imparts advanced knowledge and interdisciplinary methods of analysis, related to the languages, histories and cultures of Asia (including Japan) and of other parts of the world, thereby cultivating specialists and researchers with specialized knowledge of those subjects, as well as systematically fostering an advanced and multifaceted understanding of the Japanese language and Japanese culture, and developing individuals able to contribute to the further development of international relations, especially in East Asia. This major systematically imparts advanced knowledge and interdisciplinary methods of analysis, related to legal systems and public administration, thereby cultivating an ability to discover and pursue problems related to peace, human rights and the environment, and developing specialists and researchers with specialized knowledge of legal systems and public administration. This major systematically imparts advanced knowledge and interdisciplinary methods of analysis, related to economics and management, thereby cultivating an ability to discover and pursue problems related to the multilayered and complex economic phenomena involved in today’s increasingly globalized society, and developing specialists and researchers with specialized knowledge in economics and management. This program cultivates an ability to analyze and solve problems related to human development in the home, school and elsewhere, from the perspectives of the living environment, culture and education, and develops researchers with advanced and specialized knowledge, and an ability to solve problems related to human development. 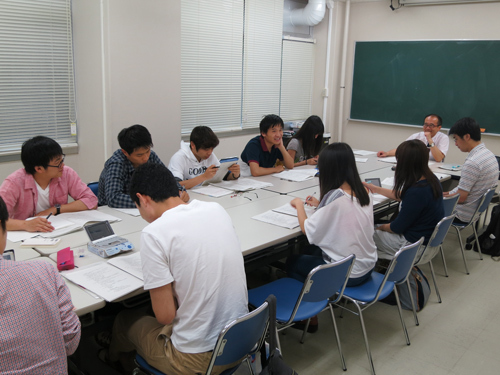 This program cultivates an ability to diversely and comprehensively analyze and solve problems related to the languages, histories and cultures of Asia (including Japan) and of various other parts of the world, from a coexistence-promoting perspective of mutual understanding and progress, and develops researchers with advanced and specialized knowledge, and an ability to solve problems related to the languages, histories and cultures of Japan, Asia, and elsewhere. This program cultivates an ability to diversely and comprehensively analyze and solve problems related to the legal, political and economic systems and structures in the societies of East Asia (including Japan) and in other parts of the world, from the coexistence-promoting perspective of mutual understanding and progress, and develops researchers with advanced and specialized knowledge, and an ability to solve problems related to law and economics. Doctor of Philosophy; Doctor of Philosophy in Literature; Doctor of Laws; Doctor of Philosophy in Economics; Doctor of Philosophy in Education. Niigata University has also concluded university-level student exchange agreements with other 62 overseas institutions, including Inha University (South Korea), Hanyang University (South Korea), National Central University (Taiwan), National University of Mongolia (Mongolia), Saint-Petersburg State University (Russia), Ankara University (Turkey), and University of Nantes (France). Our Graduate School of Modern Society and Culture also receives graduate students from these partner institutions as exchange students. More information about these university-level overseas partner institutions is available here (http://www.niigata-u.ac.jp/en/university/data/partner.html).